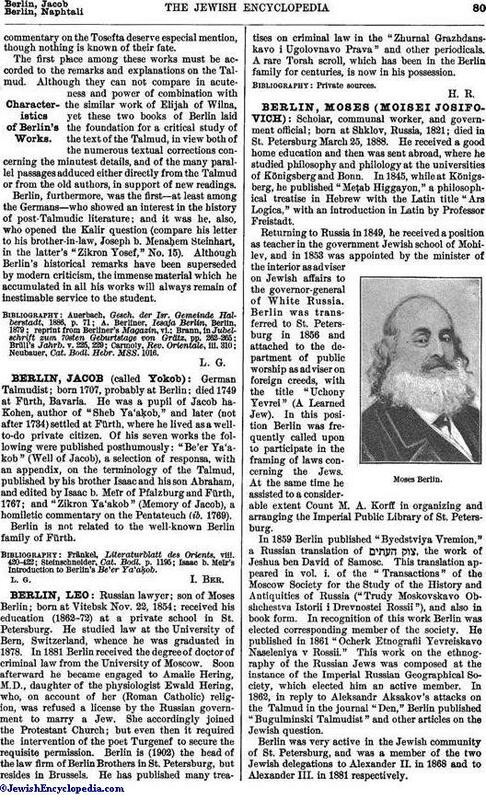 German Talmudist; born 1707, probably at Berlin; died 1749 at Fürth, Bavaria. He was a pupil of Jacob ha-Kohen, author of "Sheb Ya'aḳob," and later (not after 1734) settled at Fürth, where he lived as a well-to-do private citizen. Of his seven works the following were published posthumously: "Be'er Ya'aḲob" (Well of Jacob), a selection of responsa, with an appendix, on the terminology of the Talmud, published by his brother Isaac and his son Abraham, and edited by Isaac b. Meïr of Pfalzburg and Fürth, 1767; and "Zikron Ya'akob" (Memory of Jacob), a homiletic commentary on the Pentateuch (ib. 1769). Berlin is not related to the well-known Berlin family of Fürth. Isaac b. Meïr's Introduction to Berlin's Be'er Ya'aḳob.